Do You have your New Years Resolutions yet? If you want a little help creating a list that you can set into action, I welcome you to use this simple template. Get started now! Do you have 8 minutes to learn how you can revolutionize your whole paradigm around diet health? Maybe you can't get to Stockholm, but you can get into my next WildFit Challenge! Learn more about the 90 Day Challenge here. 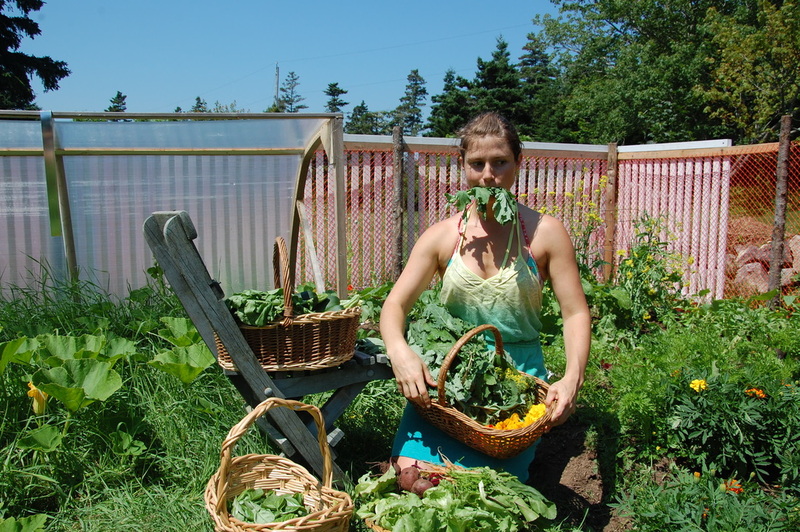 New Classes in Ketch Harbour, NS beginning July 4th! This is a new offering at the community hall- so if you are interested in attending one or more classes, please write or call to tell me so we know! MONDAYS 9 a.m. & WEDNESDAYS 2 p.m. Suitable for all ages, fitness levels and physical conditions, beginners are welcomed! Creates accessibility to all the benefits of yoga including improved muscle tone, better breathing and stress reduction- as well as a great stretch enjoyed with friends! MONDAYS 10:30 a.m. & WEDNESDAYS 3:30 p.m.
TUESDAYS 10:30 a.m. and 8 p.m.
Introduction to Meditation Course starting soon! This workshop is for the beginners to meditation. It will provide you with a good overview and insight into meditation practice while enjoying the peace and relaxation of guided meditation sessions. This workshop will help you to learn how to establish and sustain a daily meditation practice. Seated, reclining, standing and walking meditations among others will be covered during the workshop. Ariel Richards has been practicing meditation for many years. She has received training at the Shambala centre among others and uses meditation as a part of her Holistic Health practice. 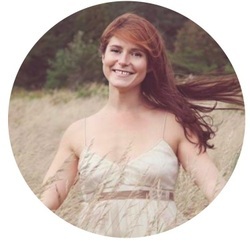 She will be offering a six week workshop at Villa Taina in the Yoga Loft to introduce you to meditation. No prior or experience in mediation is required to come and benefit from this workshop. Each session will start with a brief 15 minute asana practice. This will be followed by training on a particular aspect of meditation. The workshop will cost $50 USD for the six weeks. Pre registration is required for all non guests of Villa Taina. The workshop will be on Sundays from 10:30 am to 12 pm. Call Ariel at 829-717-8564 or email arholistichealth@gmail.com to register. I believe in synchronicity and the really joyous, magical events that come from serendipity. So- it is with great excitement that I share with you that I will be spending the next year at Extreme Hotel & Taino Farm in Cabarete, Dominican Republic. I am so honoured that I'll be working with this fun, ecocentric, fitness oasis- sharing my wellness knowledge and growing as a practitioner. I hope that the skills I gain through yoga, Crossfit and permaculture will enable me to grow my skill set as a wellness professional so that I may better serve you, my wonderful clients. I'll be sharing my physical and emotional transformation as I take on this new challenge- and I hope that you will follow me through and find inspiration in the changes that transpire. I'll keep spreading as much love and knowledge as I can through my monthly newsletter- and as always I'll be available for Skype appointments. Cheers to a new step on our wellness journey together! I am happily accepting new clients online via Skype. Contact me for your free intro session today! New Year, New You! 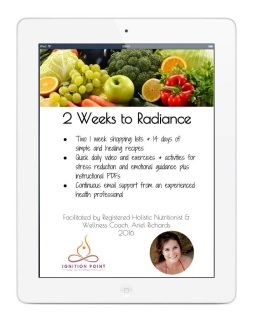 Try this 2 Weeks to Radiance Program Now! Are You excited to gain some wellness traction after a hectic and indulgent holiday? It can be hard to shake the sludgy sense of lethargy and apathy that sets in as we make our way through the holiday hustle- and if you're anything like me, as January approaches you're so ready to get back on track and start the new year off right! I've created a full and completely comprehensive 14 day wellness plan to help you shed some weight, find mental clarity and digestive rejuvenation- without drastically altering your lifestyle! The food plan is based on the most up to date research about the foods that help you most effectively burn fat and heal your tissues- You'll get detailed weekly shopping lists & 14 days of simple and healing recipes plus instructional cooking videos to help you make the most of the plan. I'll also be offering you concise, informative videos in layman's terms about why you are eating the way outlined in the plan and how it will help change your biochemistry to make you a fat burning powerhouse with enormous healing capacity. There's no book to read or complex method to learn- just follow the instructions given to you and feel the results! You'll also receive supportive video and pdf exercises & activities for stress reduction and emotional guidance to help you develop goals that you'll be able to stick to and keep yourself motivated throughout the 2 week plan and beyond! AND because I've developed this plan to help YOU, my clients, you will have continuous email support from me to help you make sure this plan meets your unique needs. This program does not come with a 100% money back guarantee BECAUSE it doesn't need one! This isn't one of those huge drumroll marketing efforts that has very little content behind it. My passion is wellness, not marketing. These are tried and true, well researched and practiced methods and recipes- and if you have any trouble with them then you can contact me directly, rather than going through some large subscribers email. The only thing that stands in the way of you having success with this program is you- and as a wellness coach I'm able to guide you through it so that you aren't able to stay in your own way! HOWEVER, this is why I'm offering this program for a nominal fee, rather than absolutely free. I wanted to offer this program as a gift to you, my clients, to thank you for such a wonderful year. BUT I know from experience that if something is free I'm less likely to stick to it! By buying a 2 week program- for less than the price of a daily coffee- you're able to commit to a program for a set length of time, knowing that you have a goal to stay focused on. You can do anything for two weeks- especially if you know exactly what to eat, when to eat it, and how it's helping you to achieve your healthiest body ever! New Year, New You! Get energized and centered by taking part in this rejuvenation plan aimed at optimizing health, adding years to life and life to years! See almost instantly how you can release stubborn weight, clear your mind and feel restored from the inside out. Take the guesswork out of forming a plan and jump into this structured 2 week program today! And as a BONUS (well, not really a bonus- more of an extra) you'll get a complimentary e-guide that will help you stock your kitchen for health and wellness in the new year! Clean eating requires planning, but as long as you know what to have on hand you'll be able to whip up easy, healthful meals in only a few minutes! Still not convinced? Let me tell you a little bit more about why this plan is so effective for almost everyone! The eating plan that I've created is based on the tenants of an anti inflammatory diet. As you may well know, many of the chronic ailments and diseases that people are suffering from (including depression, anxiety, heart disease, arthritis and cancer) are all being linked back to high levels of chronic inflammation in the body. The good news is that by changing the way you eat, you are able to reverse the damage that is being caused by this inflammation and heal your tissues! I've also taken recipes from my BIG 8 diet, which seeks to eliminate common allergens, so that the body can further speed healing and release extra weight and toxins it's been carrying. I've also made sure to include effective superfoods- common but potent herbs and spices- that have a huge capacity for increasing energy and improving digestion. This plan includes simple recipes for 3 meals and 2 snacks daily, plus a couple tonics that have nutritional superpowers- all are quick to prepare so that you're never stuck with nothing to eat and are always feeling satisfied- no bland boiled meals here! For only $20 you can have all of the materials you need to get on track to a healthy & vibrant new year- with the energetic body and clear mind that you deserve. All you have to add is the commitment to take care of yourself for 2 weeks and be prepared to see the results- I'll be right there with you to help you get over blocks and stay motivated! If you want to sign up, you'd better join us soon because programs start January 3rd and January 13th. Will I be hungry on this plan? My goodness no you shouldn't be! There's an abundance of healthful, tasty food to be had that ought to keep you satisfied all day long! These kinds of foods make you more energetic, are digested easier, and fill you up more- so you tend to shed weight and heal symptoms without feeling like you're on a diet. It takes more energy to burn natural foods, so your metabolism gets cranked up and you burn more calories while you're at rest. Are there lots of rules that I need to follow? Not really. There are specific foods that you need to eat and others to omit, but otherwise there's no calorie limit, no cheat days, and no daily tallies to keep. Are there lots of expensive supplements? Nope. It's all about nutritious food. None of it should be hard to find if you have a large market or grocery store & a health food store nearby. How hard is this going to be if I don't cook many of my own meals? Honestly, if you are not in the habit of making your own meals because you eat on the run or don't have a functional kitchen, then this plan probably won't work well for you unless you're committed to figuring out how to change some of your habits before you get started. The recipes provided are simple and straightforward- but you need a functional kitchen, plus 15-30 minutes to make most of them! You can take some time on the weekend to prep lots of the recipes so that you have them throughout the week- which is what I recommend. Meal plans work best if you're prepared! Is it suited to me if I'm a vegetarian? Yes! There are 2 versions- one omnivorous & one vegetarian. What if a lot of my social life revolves around lunches & dinners in restaurants? The go to line if people ask questions? "I'm taking a couple weeks to follow an anti inflammatory whole foods diet to help balance out my body after the holidays. It's awesome, you should try it!" What if I get super bad cravings? There are great recipes for snacks and desserts that should help fulfill those cravings- and you can take them with you to sub in when you're tempted. Most of our physical cravings for food come from missing nutrients in our diet, so as you eat more wholesome foods your cravings should naturally subside. What if I cheat or fall off the wagon? It happens. Life gets hectic, and some days are curve balls. Try your best to stick to the plan, but if you miss a meal there's no reason to let the whole day go! Just jump right back on the next time you're hungry. This plan is more about adding nutrients to your diet than tracking every morsel- so don't sweat it. Jump in, you deserve it. Get It Now! Fall Workshops are coming up soon! I love kale. Kale is awesome. We get the oil changed in our vehicles, we clean the homes we live in, we wash our clothes and ourselves- but how often do we think about cleaning the inside of our bodies? Most of our immune system and organs are designed to deal with foreign invaders, filter out harmful substances and absorb as many nutrients as possible to nourish your body. However, more often than not we neglect what we are putting into our bodies, and as a consequence we experience psychological, physical and emotions symptoms that are a result of accumulated toxins. Even the most active, mindful eaters can use a tune up every once and a while to deal with environmental pollutants and brain clutter! Come experience how powerful a group cleanse can be, and how quickly you are able to shed annoying symptoms you may have been carrying for years! After this week long, fully guided and supported detox you will feel lighter, brighter and clearer. Trust in Us- Your body's wisdom, my depth of knowledge, & the healing process. Pre register for a Rejuvenating Fall Cleanse near you today! Eudora Day Spa, Sackville, NB: Monday, Sept. 9th 7-9 p.m.
Nava Yoga, Sackville, NB: Thursday, Sept. 11th 5:30-7:30 p.m.
Halifax Yoga, Halifax, NS: Saturday, Sept. 14th 10:30-12:30 p.m.
Full Circle Wellness Center, Moncton, NB: Thursday, Sept. 19th 7-9 p.m.
Fall is the perfect time to cleanse and detoxify your body! During this workshop you will learn how a seasonal detox can help you to shed unhealthy weight, restore hormone balance, replenish energy stores and bring renewed vibrancy to all corners of your life! We live in a toxic world- we’re surrounded by (and filled with!) chemicals, toxins and negative thought patterns that can wreak havoc on our system and take away from our sense of well being. The beautiful Maritime autumn provides a nourishing and inspiring environment which we can use to encourage healing! You will come away from this with a full set of instructions, shopping list, meal and lifestyle plan to complete a gentle yet effective week long detox! Ariel will support you throughout the week to ensure this is an invigorating and painless process. Enough with the fads and gimmicks, let’s talk about the strategies that really work to get you to a healthy body and keep you there! Gain a better understanding of how your food choices and eating behaviours contribute to health issues by affecting your hormones, metabolism and pH balance. Then, learn how to apply the skills, tools and insights that you need to get healthy for life! All too often, we put everyone in our lives before ourselves and more often than not it contributes to poor health and lessened vitality. How do you learn to make yourself a priority when you’ve been last in line for as long as you can remember? By learning a new way of thinking and new behavioural skill set that’s how! Ariel has pulled out all the skills and knowledge she has to lead you through this important class, in which you will gain a new outlook and revitalized vision for your life. Re discover the happy and energized person that you know you can be- and resolve to live your life with renewed purpose and intention. Just in time for the Holidays! Sugar is not only proven to be addictive, it is harmful to every cell in your body and a causative factor in many illnesses. Many of us know that sugar pulls us out of balance, but it can seem like we’re in an endless cycle and absolutely ruled by carbs! 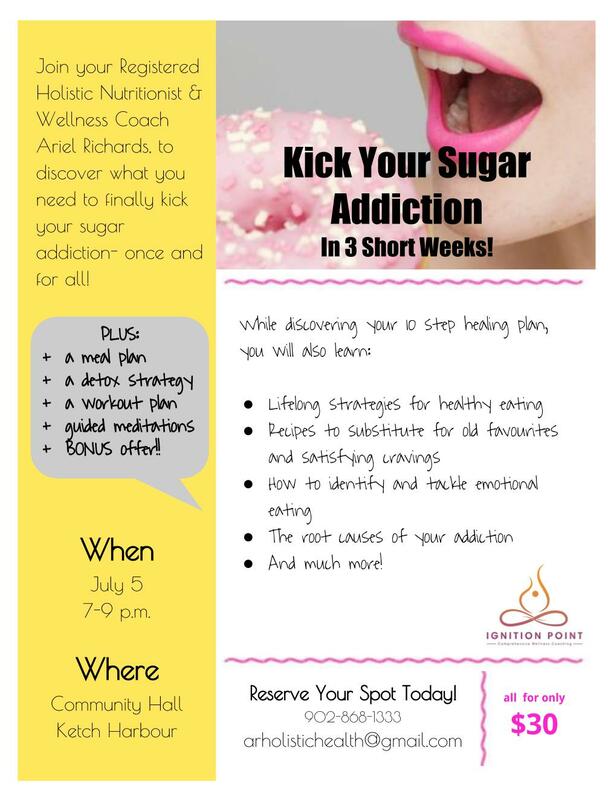 In this workshop, you will get the background you need to understand why you’re a slave to cravings and learn the steps you need to take to beat this harmful habit for good! You’ll also learn invaluable tools to use in your healing so that you feel you’re ready and completely able to heal from your addiction. All workshops are 2 hours in length, running at Nava Yoga, Eudora Day Spa, and Halifax Yoga. Snacks and tea will be provided. Cost is $30 per workshop, or the full series for $100. Pre- registration is required. If you can’t make the class in person but still want the information, it will be available in e-book format for $15 a course or $50 for the whole series! And as always, if you would like to request a particular workshop at a gathering in your area, just let me know! I've outlined the 10 keys that I believes to be crucial to losing weight and keeping it off. If you commit to integrating these simple yet powerful behavioural changes into your life, your vices will have no place to hide and long term vitality & vibrance will be yours! Enough with the fads and yo-yo dieting! During this workshop you will learn the strategies that really work to get you to a healthy weight and keep you there. Gain meaningful insights into how your food choices and eating behaviours contribute to overeating and weight gain, and the tools that you'll need to get slim and stay healthy for life! Sign up now! "Hello Ariel, I absolutely loved your presentation yesterday you are very knowledgable, picked up some very good pointers! Would love to have a 15 minute consultation!" Alexandra W.
I think that it is fantastic that employers are taking the initiative to bring wellness knowledge and empowerment into the workplace, and so I thank the Ministry of Health Coordinator at Admiral for being so fabulous in setting up this presentation! If you would like to have me present a health & Wellness seminar at your office, please contact me!